My intense dislike of lusers was rekindled this morning. Recently, a request thread was started on the PCFormat/G3AR forums that requested some extra user profile fields — which I considered entirely reasonable. So, I got into my usual routine of getting information, hearing user suggestions and so forth, when our luser decides to ask a question that I had, in fact, just answered. This isn’t too bad in itself, but redundant questions like that don’t sit at all well with me. I had already answered the question, and therefore viewed this as a time sink — and I don’t at all sit well with time sinks. Time sinks take without giving back; they waste time that could have been spent on more interesting questions and more worthy querents. This point of view may not be apparent to some, so let me explain a bit: to understand the world that experts on a particular field of expertise live in, think of their expertise as an abundant resource, but their time to response as a scarce one — and that therefore, the less of a time commitment you implicitly ask for, the more likely that you’ll get the answer you wanted. So, I replied with a terse answer while thinking “stupid question…”, and hoping that the experience of getting what one deserved rather than what one needed would have taught our luser a lesson. This consequently set off a tirade of whining, posted in one of the general chat threads and posted in Afrikaans; presumably, the luser thought that I wouldn’t notice it that way. I did. Hence this blog post in response. Odds are you’ll screw up a few times on hacker community forums — in ways detailed in this article, or similar. And you’ll be told exactly how you screwed up, possibly with colourful asides. In public. Get over it. It’s normal. In fact, it’s healthy and appropriate. Community standards do not maintain themselves: They’re maintained by people actively applying them, visibly, in public. Don’t whine that all criticism should have been conveyed via private e-mail: That’s not how it works. Nor is it useful to insist you’ve been personally insulted when someone comments that one of your claims was wrong, or that his views differ. Those are loser attitudes. Remember: When that hacker tells you that you’ve screwed up, and (no matter how gruffly) tells you not to do it again, he’s acting out of concern for (1) you and (2) his community. It would be much easier for him to ignore you and filter you out of his life. If you can’t manage to be grateful, at least have a little dignity, don’t whine, and don’t expect to be treated like a fragile doll just because you’re a newcomer with a theatrically hypersensitive soul and delusions of entitlement. One can immediately see why the aforementioned and aforelinked whining tirade does not help the luser at all. The luser attitude demonstrated in this case of (1) wasting other people’s time and (2) whining because other people expressed dissatisfaction of it simply results in the luser losing all respect within the community, which does not help the luser case at all. (We have long memories; it can take a while — years, even — for such blunders to be lived down.) I’ve seen this all before on the various project mailing lists that I’ve sat on over the years. You don’t want to be a luser, nor do you want to seem like one. You want a winning attitude in order to be treated as an equal and welcomed into our culture — and we would really want to do this (so if you think of our attitude obnoxious, condescending or arrogant, please revisit your faulty assumptions). The underlying issue at hand is that it’s extremely inefficient to try to help people who aren’t willing to help themselves. Unfortunately, I can’t do much about lusers pestering me. Hopefully, some will read this and realise what they need to change/fix to stop being one. Tagged there i fixed it, we are who we are, what's up with that? Yeah, story of my life. It goes without saying that most of us geeks tend to have rather vivid imaginations. I fell into that category — would spend my youth reading various fantasy novels (in my Grade 7 year, we had The Hobbit as a set work: I finished the book in one evening of solid reading, and then kept on re-reading it through the rest of the year). These days, I still read books of that genre (I recently discovered around R600 of old Exclusive Books gift vouchers lying around, and promptly went out and got as many of George R.R. Martin’s A Song of Ice and Fire books as the vouchers would let me), as well as having a sort of addiction to role playing games (explaining the occasional board game evening of Arkham Horror, as well as the fact that I’m an avid World of Warcraft gamer — and more recently, Diablo III). That said I’ve always been a Calvin & Hobbes fan as well. It’s something that I’ve always been able to relate to, for two main reasons: one is that I shared his vivid imagination growing up, the other being that I was just as naughty as he was. (None of those have changed, by the way!). Anyway, last night, I stumbled across the following image. 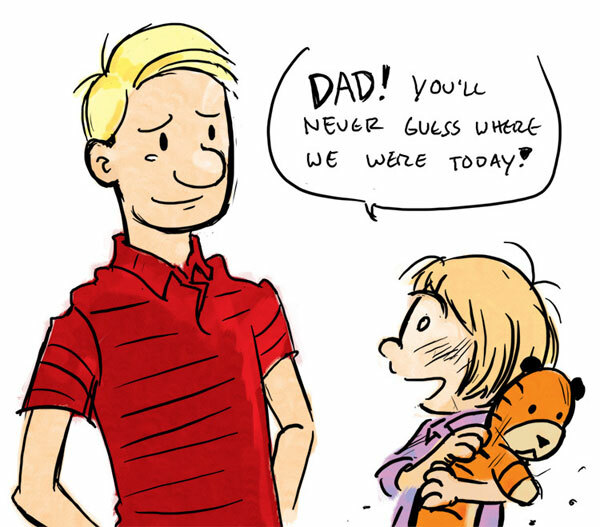 The artist depicts an adult Calvin, understanding the importance and value of having an imagination growing up. If in the future I have kids, I can imagine myself in the image as well. I don’t know who the artist is, by the way. If you know, or if the artist is you, please get in touch! This has been doing the rounds lately amongst a few of my Facebook friends. Ordinarily, I wouldn’t reproduce something like this, but as I agree with all the points made, I believe that an exception can be made here. I have no idea who the original author is; if anyone knows, please let me know so that I can properly credit him/her. Give them time to think, don’t demand answers. Give them 15 minute warnings to finish whatever they are doing. Teach them new skills privately. Don’t push them to make lots of friends. Respect their introversion, don’t try to remake them into extroverts.